North Carolina Renewable Energy Logjam Breaks Wide Open — Almost! File this one under “E” for “Elections have consequences.” Former Republican North Carolina Governor and fossil fuel fan Pat McCrory lost his 2016 re-election bid in stunning fashion to Democrat Roy Cooper, who leveraged public enthusiasm for renewable energy during his campaign. As a result, the state’s renewable energy activity is set to accelerate. On July 27, Cooper signed HB 589 into law, putting new regulations in motion aimed at reaching a statewide solar target of 6,800 megawatts by 2020 — more than double what it has now. That’s the good news. The bad news is that Governor Cooper signed the bill despite an anti-wind amendment that slid into the process at the last minute … although, Cooper could get the last laugh after all. Former Governor McCrory staked his political fortune on the fossil-friendly Koch brothers and North Carolina businessman Art Pope, among other conservative supporters, but his efforts to stymie renewable energy development during his relatively brief tenure (2013–2017) had mixed results. North Carolina already had an aggressive solar energy policy cemented in place due to its relatively liberal interpretation of the Public Utility Regulatory Policies Act (PURPA is national legislation designed to promote energy efficiency and renewable energy in the aftermath of the 1970s oil crisis). That meant North Carolina was well prepared for the solar boom that began under the Obama Administration. 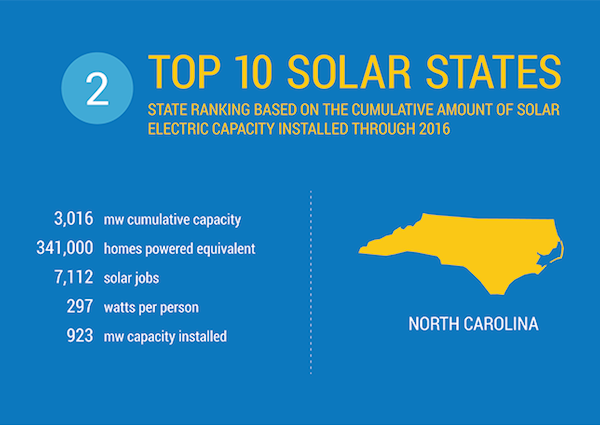 By the time President Obama left office, North Carolina followed only California in installed solar capacity. The new solar law probably doesn’t make everyone happy, but it apparently comes close. Among other provisions, it enables solar developers to access low-cost financing, permits property owners to lease rooftop solar panels, and sets out a process for selecting sites for utility-scale solar farms. The new law also enables state residents to buy into offsite solar farms owned by utilities, meaning that residents have a way to get renewable energy credits even if they don’t have solar panels on their own property. The picture is not nearly as bright for wind power. Last month, CleanTechnica was among those taking note of a push by several Republican legislators to impose a moratorium on wind development in the state. Though the anti-wind faction was opposed by other Republicans as well as Democrats, they still managed to insert an 18-month moratorium amendment into HB 589. That’s not as bad as the four-year moratorium originally proposed, but it puts a huge crimp in wind development. So, why did Cooper go ahead and sign the bill? And, it looks like Cooper had a trick up his sleeve. It remains to be seen if EO 11 withstands any legal challenge, and if it provides wind investors with enough security to continue working through the permit process during the moratorium. Meanwhile, despite President* Trump’s pro-coal rhetoric, the Interior Department has been moving ahead with offshore wind leases, included an area off the North Carolina coast. Avengrid Renewables won the North Carolina lease in March, and so far the company doesn’t seem to concerned about the wind moratorium. After all, the offshore area is in federal waters, far beyond the reach of state legislators.